The lands comprised within the present limits of the township of Amherst are a part of those acquired by John Pynchon of Springfield, by purchase from the Nonotuck or Norwottuck tribe of Indians in 1658. In 1653 a number of men residing in Windsor, Hartford, and other places in Connecticut petitioned the General Court of Massachusetts to grant them a plantation at Nonotuck, above Springfield. This petition was granted and the General Court appointed three men of Springfield, John Pynchon, Elizur Holyoke and Samuel Chapin, to divide the land into two plantations, the petitioners to have one of them. In December, 1658, Major Pynchon secured from the Indians the following deed of land. This deed embraces the land from the mouth of Fort River and Mount Holyoke on the south, to the mouth of Mohawk brook and the southern part of Mount Toby, on the north, extending easterly nine miles into the woods. "Here followeth a copy of a deed or writing whereby the Indians of Nolwotogg, upon the river Quienecticott, made sale of certain lands unto Maj. John Pynchon. of Springfield, together with the copy of the said Maj. John Pynchon his assignment of the said deed to the use and behoof of the inhabitants of Hadley, and his acknowledgment thereof. Be it known to all men by these presents that Chickwollop alias Wahillowa, Umpanchella alias Womscom, and Quonquont alias Wompshaw, the sachems of Nolwotogg, and the sole and proper owners of all the land on the east side of Quonicticot river, from the hills called Petowamachu, and from the mouth of the brook or river called Towunucksett, and so all along by the great river upward or northward to the brook called Nepassooenegg, and from the hither part of south end of the great hills called Kunckquachu, (being guessed at near about nine miles in length) by the river Quenecticott—We the aforenamed Chickwallop alias Wahillowa. Umpanchala alias Womscom, and Quonquont alias Wompshaw of Nolwotogg, on the one party, do give, grant, bargain and sell unto John Pynchon, of Springfield, on the other party, to him, his assigns and successors forever, all the grounds, woods, ponds, waters, meadows, trees, stones, & c. lying on the east side of Quenicticot River, within the compass aforesaid, from the mouth of the little Riverett called Towenucksett, and the hills Petowomuchu northward up the great river of Quenecticot, to the Brook Nepowssooenegg, and from the south end of the hills Quaquachu, being near about nine miles in length, from the south part to the north part, and all within the compass from Quenecticot River eastward nine miles out into the woods, all the aforesaid tract of ground called Towunucksett, Sunmukquommuck, Suchaw, Noycoy. Gassek, Pomptuckset, Mattabaget. Wunnaquickset, Kunckkiunkqualluck, Neposeoneag, and to the south end of the great hill called Kunckquachu, and for nine or ten miles eastward from the great river out into the woods eastward—We the said Chickwallop, Umpanchella. and Ouonquont, do for and in consideration of two hundred fathom of wampom, and twenty fathom and one large coat at eight fathom, which Chickwallop sets off, of trusts, besides several small gifts, and for other good causes and considerations do sell, give, grant, and have given, granted, bargained and sold to John Pynchon, of Springfield, and to his assigns and successors all and singular there aforenamed land, or by whatever other name it is or may be called, quietly to possess, have and enjoy the aforesaid tract of ground free from all molestations or incumbrances of Indians, and that forever, only the Indians aforenamed, and in particular Quonquont. doth reserve and keep one corn field about twelve, sixteen, or twenty acres of ground, a little above Mattabaget, by the brook called Wunnaquickset, lying on the south side of the said brook, and compassed in by a swamp from that brook to the great river, and also they reserve liberty to hunt deer, fowl. & c. and to take fish, beaver or otter, & c. but otherwise all the aforesaid premises the said John Pynchon, his assigns and successors and their heirs shall forever enjoy absolutely and clearly, free from all incumbrances of any Indians or their corn fields forever, except as before excepted. And in witness hereof, we the said Indians do subscribe our marks this present twenty-fifth day of December, 1658. It is only the corn field on this or south side of the brook called Wunnuckeckset, and the little bit of ground by it within the swamp and betwixt the swamp and the great river which the Indians do reserve, and are to enjoy. But the little corn field on the other side or further side or north side of Wunnaquickset, and all the other corn fields within the compass of ground aforenamed, the Indians are to leave and yield up, as witness their hands. The mark—of Umpanchla alias Womscom. The mark—of Quonquont alias Wompshaw. The mark—of Chickwalopp alias Wowahillowa. Witness to this purchase and that the Indians do fully sell all the lands aforementioned to Mr. Pynchon, and that the marks were subscribed by the Indians themselves. 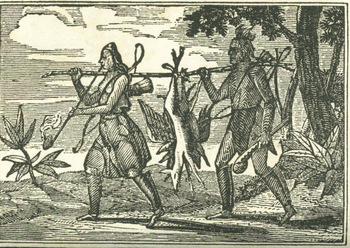 The mark R. T. of Rowland Thomas, who was privy to the whole discourse and conclusion of the purchase, and Joseph Parsons was present and acquainted with the whole agreement; the other witnesses came in to testify to the subscribing, and that the Indians owned all as it was read to them. The Indians desired they might set their wigwams at some times within the tract of ground they sold without offence, and that the English would be kind and neighborly to them in not prohibiting them fire-wood out of the woods, &c. which was promised them." —From The History of Amherst by Carpenter and Morehouse, 2-3. Carpenter, Edward Wilton and Charles Frederick Morehouse. History of the Town of Amherst, Massachusetts. Amherst, Mass. : Press of Carpenter & Morehouse, 1896. Available at the Jones Library or on GoogleBooks.